What is the best way to protect your computer files so you don’t lose everything in the event of a crash? Over the past 20 years, I have tried all kinds of methods to keep my data safe. One thing I realize is that it is imperative to have a backup plan in place before the unthinkable happens! Cloud backups seemed like a great idea. Then my hard drive crashed and I realized it was going to take several weeks to download my files back to my new hard drive, I canceled my Cloud backup service. Not to mention the risk of my data being stored online where they are vulnerable to hacking, no matter what the service sells you. I do store some stock photos and graphics on Dropbox, but no personal data. You’d be surprised at how many important passwords, banking, and other valuable personal information you save to your hard drive for “safe keeping”. For many years, I occasionally copied all of my important files to CDs and then DVDs. I now have hundreds of backup disks and if I ever need to find a particular file, it could take some time. This was also a time-consuming process and I had to remember what files and folders were the most important to back up. I eventually purchased an external hard drive and started backing up my files there. The problem I had with that was that I had to remember to back up my files on a regular basis. Needless to say, it didn’t get done as often as it should have, but this was a step in the right direction. Six years ago, I discovered a program called SyncBack SE. 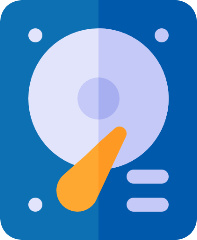 This program can be configured to copy everything on your hard drive (sync), mirror your hard drive, or back up just the important folders and files like your Outlook email files. It can be set to run at night when you aren’t using your computer, but it can also run in the background while your computer is in use. With SyncBack SE, you can set up your backup schedule to run as often as you’d like and forget about it. If you use the normal backup function, it will backup your files and then only copy over files that have changed, so the backups run pretty fast. I like this option because if I delete a file from my computer, it stays on the backup drive unless I delete it from there, too. I have two external backup drives. On one, I have a mirror copy of my computer so if my hard drive crashes, all of the programs can be restored from this backup. This will save me the time of re-installing everything if my main hard drive ever crashes. The second drive is for everyday backups of my email, documents and other files I access regularly. Between these two backups, I have myself covered! Once you have the synced copy of your hard drive, it’s a good idea to store that drive off-site in case of fire. It can be stored at a close relative’s or anywhere it will be safe and accessible if the unthinkable happens.